The Fort Worth Community Arts Center is proud to announce a Shop Small Saturday event. Small works by local artists will be for sale to the public for a special one day event on the Saturday following Thanksgiving, November 26 from 10AM to 4PM. Behind every small business there’s a story worth knowing. Small Business plays a big role in making our community great! Lael Burns explores her interest in the tensions between spiritual and material aspects of life. She uses hot rod car graphics and colors, and softer, delicate organic forms to make connections between the visceral and graphic. By relinquishing precise control of the shape glass takes, Morgan Chivers achieves a form reminiscent of large-scale cosmological simulations. A sale and exhibit of functional and sculptural ceramics. Sale: 5 – 9pm Friday, 10 – 4pm Saturday. Judith Wolf and Doris Mobley are two friends who exhibit together. Kelly Ingleright-Telgenhoff explores the duality that exists in life, pairing the beautiful with the grotesque, the real with the abstract, the minimal with detailed. Roy Richardson strives to design color photographs that all can enjoy. An exhibit by Ken Spencer of black and white photographs along and near the Rio Grande river as it forms the border between Big Bend National Park and Mexico. A solo show of landscapes, flora, and symbols of the west by nationally-recognized artist Louis Escobedo. An exhibition exploring the diversity within the artist book medium. Edgar Miller seeks to find interesting light on interesting subjects. Works under 15″, perfect for holiday gift-giving, all created by local artists. A sale of ceramic sculpture and pottery. Hope International Development Agency presents An Evening of Hope Fundraising Event. Join us for a wonderful Ethiopian meal and special entertainment, the company of friends, a silent auction, great music, a short feature film, and an important opportunity to transform lives in Ethiopia through your giving. This 3-day intensive workshop with artist Louis Escobedo will be held in the Back Gallery from 9:30 am – 4 pm. Call for more information. 817.298.3026. Morgan Chivers graduated from San Jose State University in 2011 after spending a full decade earning four simultaneously conferred degrees with five associated minors: BA in History, BA in Global Studies, BFA in Photography, and BFA in Spatial Arts, with minors in Anthropology, Music, Religious Studies, German, and Environmental Studies. His approach to the world is inherently cross-disciplinary; the lusts for knowledge and context drive his life. Drawing on recent critical theories that foreground the vibrancy of things, Dr. Anne Keefe will introduce a theory of “thing lyric” to investigate how the artist’s book itself becomes an agent in the collaborative process of reading. Experience the beautiful culture of Hawaii through dance, music, stories and language. Each class will have segments of basic hula hand and feet movements, history, storytelling, music, learning about traditional hula instruments, and basic Hawaiian language as it relates to hula dance. You will learn a beautiful hula about a well-known Hawaiian Goddess, and have the opportunity to perform your hula at the Workshop showcase on November 17. Small fine art and craft works by local artisans. Free and open to the public. Come browse our small gift shop where you can purchase unique, artist-made pieces, as well as original jewelry, ceramics, glass, woodwork, metalwork, wearable art, handmade prints, photography and other fine art and craft works! We are taking submissions for new works in the ARTshop! Love to swing dance (or wanna learn how)? Fort Worth Swing Dance Syndicate hosts dances and classes every Thursday from 8:00-11:00 pm! Admission is $7.00 for non-members or $5.00 for members/students/affiliates (with valid ID). 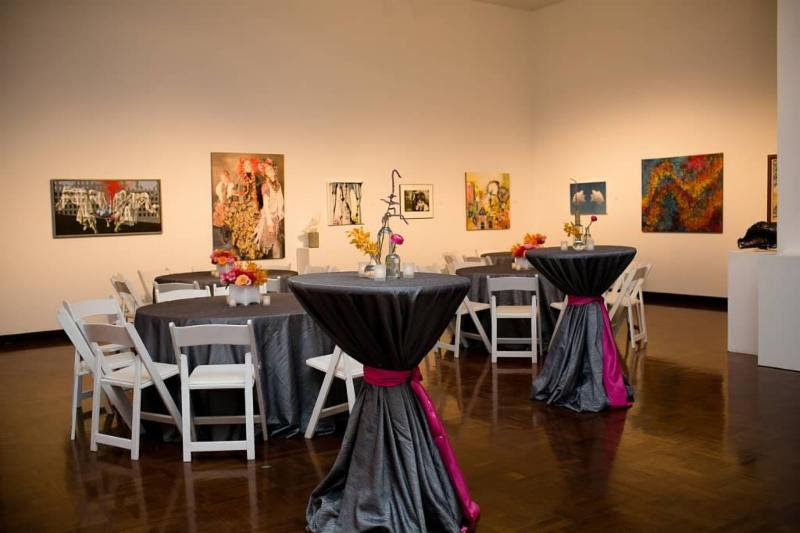 The Fort Worth Community Arts Center is the perfect place to have a wedding, conference, or any other special event. Whether it’s a private or corporate event – we can accommodate with beautiful spaces, catering, and stunning local art. An on-going Friday morning painting class, open to all levels and all approaches with students receiving individualized instruction. Tuition: $140, or $120 for TAC members. ART7 Gallery, 820 Currie St. The Texas Artists Coalition is a membership program designed to offer benefits for artists in the North Texas community. The mission of the TAC is to support the career development of artists, whether they are emerging or established, amateur or professional. Programs of the TAC are supported by the Arts Council of Fort Worth, the Fort Worth Community Arts Center and a grant from the Texas Commission on the Arts. to get the latest news or to join TAC today.